The state government of Odisha, under the watchful eyes of the CM have been dolling out several schemes for the betterment of the poor and needy people. Though farmers feed the nation, they don’t enjoy any financial prosperity. 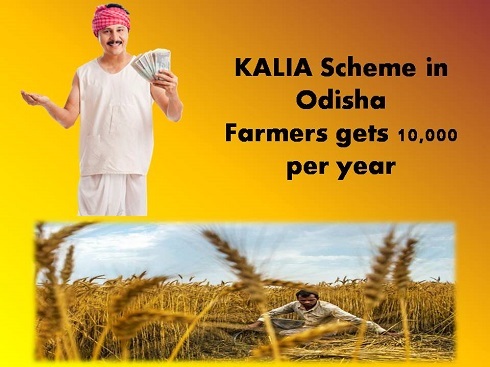 In a bit to change their sorry state, Odisha government has designed and developed the KALIA scheme. It not only aims at offering respite to farmers who took credit, but also makes way for the development of agro-related industries. Apart from financial assistance, eligible old and disabled farmers will also get financial help. To know more about the eligibility, application process and scheme benefits, read the article carefully. Boosting agro-industry – The overall financial condition of poor farmers is not good in Odisha. To change the circumstance, current CM of the state has implemented this scheme. As it brings in several aspects under one umbrella, it will bring forth comprehensive agricultural development in the state. Financial assistance for farming – Kharif and Rabi are the two main cropping seasons in India. All eligible and selected applicants will attain Rs. 10,000 from the Odisha authority. They will be able to utilize Rs. 5000 during the Kharif crop and Rs. 5000 during the Rabi crop season. DBT facility – To get the financial benefits, applicants must have bank accounts. The authority will send the money to the respective applicants via Direct Benefit Transfer process. Assistance duration – Once implementation starts, the Odisha authority will offer the benefits to the applicants for 3 continuous years. Number of recipients – Around 30 lakh farmers will be directly benefited by the implementation of the scheme. It is because the scheme covers agro as well as related practices. Additional grant for securing livelihood – Securing the livelihood for agricultural workers is another objective of the project. This can be anything other than the farming, like fishery, goat or chicken rearing etc. Around 10 lakh applicant, interested in these practices will attain Rs. 12,500 from the state authority. This grant will help them in the initial setup process. Assistance for the disabled and old applicants – Under the KALIA project, a specific monetary grant has been set aside for old and physically handicap farmers. Such candidates will attain Rs. 10000. Though the number of old farmers has not yet been specified, around 10 lakh candidates will reap the benefits as they come under physically handicap category. Budget for the sub-schemes – It is a mammoth scheme, and the state government will have to arrange as much as 10,000 crore for the implementation of KALIA project. But that is not all. This project has sub-scheme for the old and disabled. An additional Rs. 1,000 crore is necessary for meeting the needs of this section. Life insurance policy – Apart from the crop assistance, the state also wants to secure the life of farmers and their families. Thus, it will also offer life insurance policies for the eligible applicants. In case of natural or accidental death of the farmers, his family will acquire Rs. 2 lakhs as policy coverage amount. Around 57 lakh farmers will attain this life cover policy. Interest free credits – There is also the provision for attaining interest free credits. Farmers will only attain this perk if they use the money for agricultural activities only. The scheme also highlight that the interest free perks will be available if the credit amount does not cross the Rs. 50,000 mark. Residents of the state – The monetary requirements of this project will be arranged by the Odisha government. Thus, applicants must be permanent residents of the state. Additionally, if they don’t possess residential certificates to support this claim, they will be barred from getting the benefits. Farmer by occupation – This is an agro-developmental project. Thus, people who are farmers by profession will only be considered during registration. Economic background – The launch of this scheme has been done to offer financial support to needy agricultural workers. Thus, only those people, who belong to small or marginal sections, will be able to enroll. Personal ID documents – Aadhar card, voter card and ration card are some of the documents, which will support the personal claims of the farmers. Thus, attaching photocopies of these documents is a must for all farmers who desire to register under this scheme. Details of bank account – The cash, offered by the Odisha government will be via DBT ort Direct Benefit Transfer. For this, interested farmers will have to mention their bank account details properly. Age proof – Farmers, who belong to a certain age bracket, will attain benefits as per the old age category. Such applicants will have to produce their age proof documents for background checks. Disability proof – There are some benefits, which will be reserved for the farmers, who are unable to work due to some physical incapability. To get this, applicants will have to furnish their disability certificates. Farming loan related papers – Under the scheme, applicants will also be able to attain farming loan, without worrying about the payment of any interest on the amount. To avail this benefit, it is mandatory for applicants to submit all former credit papers. How to register and get application form? All farmers, interested in attaining the benefits of the scheme will have to make a separate application. For this, the state government has launched a new site. The address of this portal is http://kalia.co.in/index.html . It will trigger the opening of the main portal. There are several tabs on the man menu section. Candidates who desire to register will have to click on the option that is marked as “Form. Applicants will get access to the required document by clicking on the respective options. These digitized documents are available in PDF format. Thus, interested farmers will be able to download them easily with the click of a button. Once the form has been downloaded, farmers can get a print out and fill in the details before its submission. To get to the authorized site, applicants will have to click on the link kalia.co.in. As the page appears, applicants will have to generate the process by clicking on the option that is marked as “Beneficiary List.” One can bypass the above mentioned steps and gain access to this list by clicking on the link http://green.kalia.co.in/BeneficiaryGreen.aspx. It will trigger the site to generate the beneficiary list for the second phase of this project. Applicants will have to click on the dropdown arrow and pick the respective district name. Then they will have to do the same to select the Block. It will trigger the site to bring forth a list that has been created and maintained by the respective Gram Panchayat bodies. These separate lists will contain the names of the applicants. The lists are available in PDF format. This means these can be downloaded easily. For this, farmers will have to click on the “Download” option. Once the download is complete, they will have to type in the captcha code and generate the main list for viewing purpose. This step will trigger the portal to display the entire beneficiary list, containing the names, gender, block details, village names and father/husband’s names of the applicants. This scheme has been targeted towards the betterment of both small and marginal agricultural labors. Odisha government is all set to do everything in its power to popularize this project. It wants to offer the benefits to as many eligible applicants as possible. There are no extra points for guessing that the development of the farmers will pave the path for better agricultural production. This, in turn will boost the overall GDP of the state.